We are now offering a new payment option for our US customers that want to pay cash for the software: PayNearMe. With PayNearMe, you can purchase our software online and pay "offline" with cash at your nearest 7-eleven store! - Recommend our software to a friend and get a free upgrade! If you know someone who bought the software after you recommended it to them, you could get your upgrade for free. Email us the details of the person you "sponsored" and your next 1-year upgrade is on us (valid for non-Goldmembers only and for sales made after May 1st, 2011). June 5th is World Environment Day. Did you know VSO Software was a “green" company ? Our downloads are sent by email instead of boxes sent out by post, and we perform regular cleanout of our servers to free space and resources. 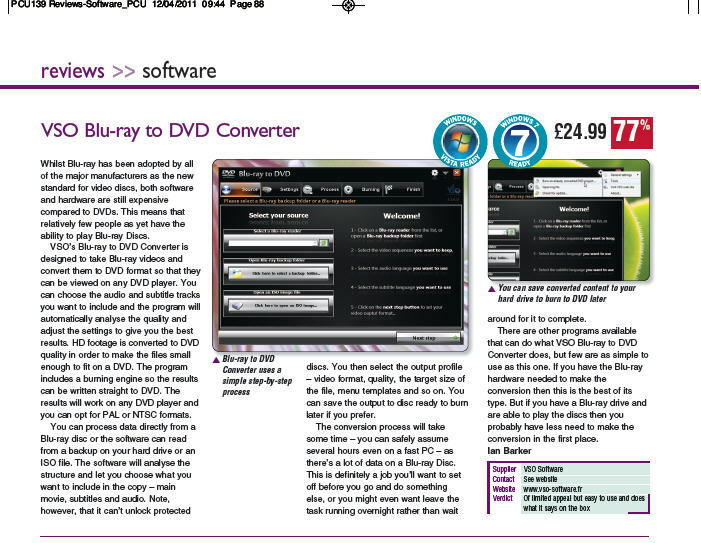 PC Utilities (magazine published in UK, USA and Australia) put our Blu-ray To DVD to the test. Read the article here. Every now and then we’ll introduce you to one key actor to VSO Software’s success. We start this month with Spiros, one of our main beta tester. Discover who he is, what he does and how his help is unvaluable by reading the full interview . Sometimes your videos come in different parts (CD1 + CD2...) or you have very short files from a camcorder, that you want to join together. You can do this with ConvertXtoDVD and get one unique file. Insert your 1st video then do a "right click" on it and select "merge more files to this titleset". Then insert the second file, and so on. You can also use the "shift" fonction and press "merge". More detailed info in this post in our forum. Finally... keep your eyes open... a new downloading tool will be released very soon! You can use our Facebook and Twitter accounts to get info or drop us any feedback /commercial question. We also have an online support form.